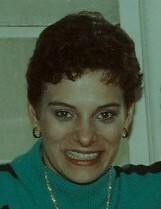 FULLERTON, CALIFORNIA - Rhonda Jean Ewing Finlay, 40, formerly of Lawn, died Tuesday, July 26, 2005. Graveside services will be 2 p.m., Monday, August 1, 2005, in Lemons Gap Cemetery, with the Reverend Marty Reed officiating, directed by Fry-Bartlett Funeral Home in Tuscola. Visitation will be today from 6:00 to 8:00 p.m. at the funeral home. 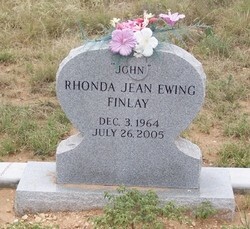 The daughter of Carrol Gene and Della Fae Johnson Ewing, Rhonda was born December 3, 1964, in Abilene. She was a 1984 graduate of Jim Ned High School. She lived in Dallas and Waco before moving to California in 2000. She was a licensed radiologist and dental assistant in the state of California, and was a member of La Habra Baptist Church in La Habra, California. Survivors include a son, Ryan McCoy Finlay of Whittier, California; her parents, Carroll and Della Ewing of Lawn; an uncle, Riley Ewing of Elmdale; three aunts, Fern Baird of Temple, Helen Hackney of Clyde, and Shirley Roberson of Hodges; and several cousins. Family and friends are asked to gather at the Ewing home, The Outfitters, at 5818 Highway 84, north of Lawn, prior to the service to travel to the cemetery in procession.